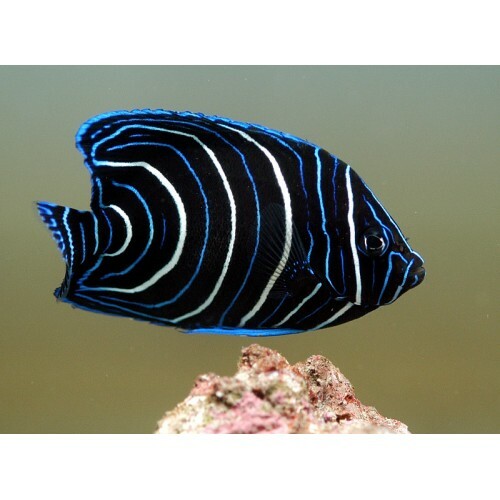 The Koran Angelfish, also referred to as the Semicircular Angelfish or Halfcircled Angelfish, is an extremely popular and hardy angelfish. As an adult, the body color is a yellow-green that bleeds from light to dark moving front to back along the body. Lighter areas are speckled-blue while darker areas have a more yellow-speckled appearance. The head is a plain yellow-green with sapphire-blue gill margins and eye rings. The fins are also outlined in sapphire blue. 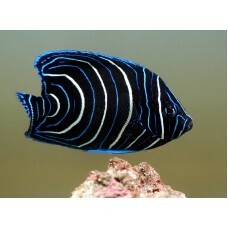 The juvenile is black with white and blue stripes. The Koran Angelfish requires a 250 gallon or larger tank with large amounts of live rock for hiding and grazing upon slime algae and cyanobacteria. It is prone to nip at stony and soft corals (sessile invertebrates) and clam mantles so it is not a good candidate for a reef aquarium. The recommended water temperature is 72-78º F / 22-25.5º C. Keep the specific gravity between 1.020 and 1.025 and the pH-value within the 8.1-8.4 range.